The Pawtucket Red Sox are offering fans the special opportunity to sing the National Anthem prior to a PawSox game at McCoy Stadium during the upcoming 2018 season. 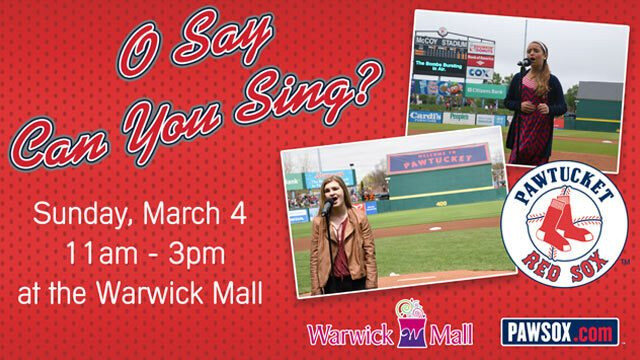 The PawSox will hold auditions for interested singers and musicians on Sunday, March 4 from 11am-3 pm at the Warwick Mall on 400 Bald Hill Road in Warwick, RI. "O Say Can You Sing?" will take place at the "center mall." Thank you to all of those who registered for our National Anthem auditions. Due to the overwhelming response, we are no longer accepting applicants at this time. If you are interested in performing at a PawSox game this season, please submit a link with your 90 second a Capella performance of the National Anthem to jdempsey@pawsox.com. "Baseball games have a soundtrack," said PawSox President Dr. Charles Steinberg, "And the blend of patriotic music and popular traditions contribute to that musical backdrop. Live performances by soloists, singing groups, and musicians enhance the cohesiveness of our community, and we welcome all who would like to share their talents." Alana Cerrone, reporter for ABC6 News, Brian Mulhern of Cat Country, and Steve McDonald of WHJY and Newsradio 920/104.7 FM, will serve as "mentors" and provide feedback after each performance. !--Performers of any age are welcome.-->The 2007 and 2013 Boston Red Sox World Series trophies will be available for all to see and take photos with. Jackie Dempsey, who coordinates the presentation of singers and performances at PawSox games, can be reached at jdempsey@pawsox.com. The PawSox are scheduled to play 70 home games during the 2018 home season, which begins on Friday, April 6 with a 7:05 pm game vs. Lehigh Valley at McCoy Stadium.